In the state of Washington, all drivers must register their vehicles within 15 days of purchasing or becoming a residence. Failure to do so leads to additional fees and charges. You can register your vehicle at any of the local offices, either in person or by mail. 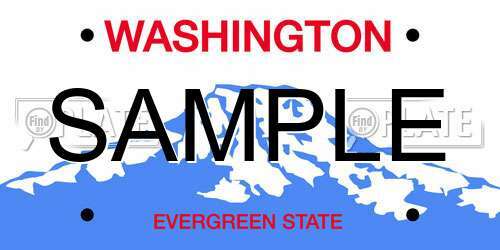 After you have successfully completed your registration, you may be apply to receive new license plates in Washington, immediately. If you require personalized, specialized, or disability license plates, you may have to wait. Note: when you title your vehicle you will also be registering your vehicle at the same time. If you purchased your vehicle from a dealership in Washington, they are likely to handle the registration of your vehicle. If so, you can drive off the lot using temporary plates or tags and wait a about a week for your license plates to arrive in the mail. If you purchased your vehicle at a private sale, you have 15 days to title and register your vehicle. Owners of the previous car must remove or surrender their license plates. Also, you can check the history and ownership of that vehicle using the previous license plate number online. $2 everyday after, up to $125 max. Simply go to the nearest licensing centre to register your vehicle to avoid these late fees. You must renew your vehicle’s registration before the expiration on the tags. It is best to renew your license plates before the expiration date to avoid additional fees. It may happen that your plates go missing and while you don’t have to report your plates to the police, doing so prevents them from being abused. Unfortunately, you will not be able to get the same number if your plates were stolen. You are permitted to transfer your license plate to another vehicle that is titled and registered in your name. You can do this either in person, online or by mail and you must confirm your address is correct. Alternatively, if you have no intention of purchasing a new vehicle and transferring your plates, you should surrender your plates. You can use a license plate search to see what plates are available for you. Each of these customized license plates requires registration, additional fees and, sometimes, additional documentation to be eligible. Additionally, you’ll have to pay taxes and some other additional fees to register your vehicle in Washington. If you want to know the history behind a vehicle, you can perform an online search using a license plate. You can obtain critical information about the past driver and vehicle. Additionally, you can use this free online license plate search to check for available numbers for a personalized plate.